1. The Body Finder by Kimberly Derting- It's no surprise that this is my favorite book of 2010. If you've read my blog before, you know how much I love the mystery, paranormal as well as some criminal elements in this book. Plus, who doesn't love Jay? 2. 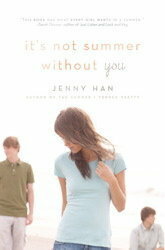 It's Not Summer Without You by Jenny Han- I'm pretty much obsessed with this series. Jenny Han is an amazing writer. This book/series is outstanding and my words cannot do it justice. 3. Mockingjay by Suzanne Collins- No one, and I mean no one, can get my heart racing like Collins can, well, maybe Christian Bale as Batman, but Collins comes a close second. She's a fantastic author and this series captured so many hearts and attracted so many reluctant readers. How could Mockingjay not be on my top ten? 4. Anna and the French Kiss by Stephanie Perkins- This book is swoon-worthy and plus, it takes place in Paris. If you enjoy contemporary romances, you MUST read this book. Do you want to win your own copy? Check out my giveaway here. 5. Matched by Ally Condie- Dystopian fiction is one of my favorite genres and this novel is brilliant. I love the world that Condie created. This book was one of the most anticipated books of 2010 and I'm so thankful it didn't disappoint. 6. 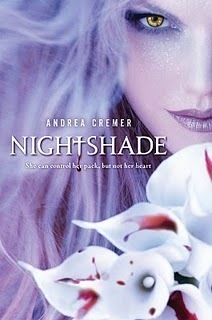 Nightshade by Andrea Cremer- I didn't even know I liked books with werewolves until I read this one! This book had me up late flipping the pages and there's an incredible love triangle! 7. Clockwork Angel by Cassandra Clare- I am a HUGE fan of Cassandra Clare; she is an incredible storyteller. I loved the setting of this novel and the steampunk element. 8. Revolution by Jennifer Donnelly- Jennifer Donnelly is a "new to me" author and I am a major fan after reading this one. Revolution blew me away and as a fan of historical fiction, it was simply a perfect read. 9. Paranormalcy by Kiersten White- I was pleasantly surprised by this novel. I thought it was going to be derivative; however, it's extremely unique and a lot of FUN! 10. Last Sacrifice by Richelle Mead- Wow! I can't believe the series is over! I am so sad that it's the end, but Mead did a great job. Rose is one of my favorite heroines and Dimitri......definitely one of my literary crushes. If you'd like your own signed copy of this one, check out my giveaway. 1. The Agency: A Spy in the House by Y.S. Lee- This is another novel that took me by surprise. I love Victorian England so I was immediately intrigued. If you are a fan of mysteries and historical fiction, you must check this one out! 2. 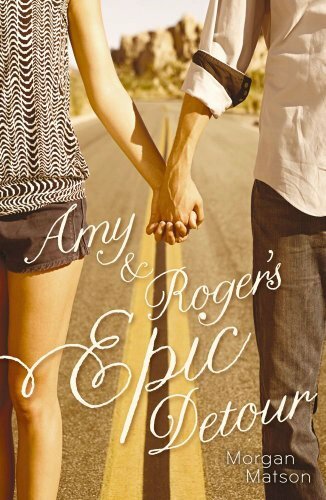 Amy and Roger's Epic Detour by Morgan Matson- I love road trips and this book truly encompasses the excitement and discovery that one goes through on a road trip. Amy and Roger's journey is one that I enjoyed and this is the perfect summer read. 3. Before I Fall by Lauren Oliver- At the time, Oliver was a "new to me" author and I was blown away by her writing style and the story's premise as well as the message. I thought this was a powerful read. 1. Saving CeeCee Honeycutt by Beth Hoffman- If you love a good southern story, then you would enjoy CeeCee's. The characters in this novel are truly unforgettable! 2. The Distant Hours by Kate Morton- Morton was a "new to me" author and her writing style is enthralling. I was completely captivated with the way she weaved this tale. 3. Brava, Valentine by Adriana Trigiani- I am a huge fan of Trigiani and I highly recommend this series, especially if you enjoy the crazy antics of Italian families. 4. The Red Queen by Philippa Gregory- I thought The White Queen was better, but this one was still a compelling tale for fans of historical fiction. So, there you have it! There are some more books published in 2010 that I'd like to read in the next few months, but I thought I would share my list before 2011 arrives. I look forward to another year of reading and talking about books with all of you! What an honor to have my novel on your adult fiction list! Thank you so much, Christina. Nice lists. CeeCee and Brava Valentine are on my 2010 Favorites list. Great list! I've read Mockingjay, Anna and the French Kiss, Clockwork Angel, and Last Sacrifice and I loved them all. I also really have to read It's Not Summer Without You and Before I Fall. Beth- Thanks for stopping by! I appreciate it. Happy New Year! Mary- Thanks for visiting my list! Andi- I highly recommend It's Not Summer W/O You. I hope you get to read it soon! Leanna- I hope you LOVE Anna and the French Kiss. I can't wait to hear what you think of it. Nina- I hope you get to read them all! :) Happy New Year! What a great list! Mockingjay is definitely up there on my list as well (even though I felt a bit disappointed by it). LOOOOVED Anna and the French Kiss and Before I Fall. Lauren Oliver is such a talented writer! Thanks for your adult recommends as well! In the adult area, I recommend I'M DOWN which is a HILARIOUS memoir about race relations(I know it does not sound funny but it is so great). Hope your new year was awesome :) Here's to a great 2011! can't wait to read some of the title you mentioned for YA books. I have most of them now it's just setting myself down to gobble them up. I agree The Distant Hours is amazing and you have to read YA Forbidden by Tabitha Suzuma. Suzuma's tale of Forbidden love made me cry to no ends.